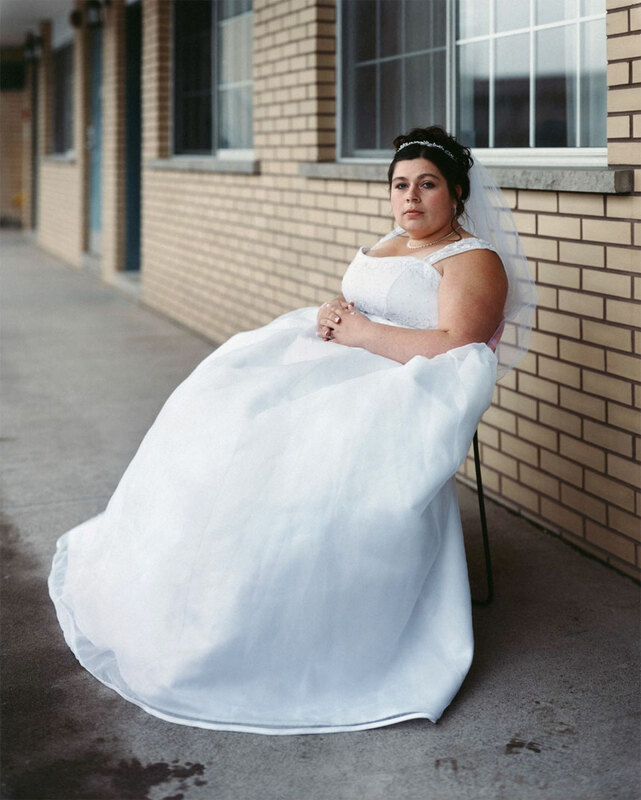 “Melissa” (2005, Chromogenic print, 50”h x 40”w) by American photographer Alec Soth is on display at the de Young Museum through September 16, 2012, as part of “Real to Real: Photographs from the Traina Collection.” The image was taken at the Flamingo Inn at Niagra Falls, the former honeymoon capital of the world, just after the woman, Melissa, was married. Image courtesy: Traina Collection. An engaging and controversial show, Real to Real: Photographs from the Traina Collection is closing this Sunday, August 16, 2012, at San Francisco’s de Young Museum in Golden Gate Park. Drawn from the impressive holdings of San Francisco native Trevor Traina, a member of the FAMSF Fine Arts Museums of San Francisco Board and the son of its President, Diane B. (Dede) Wilsey, the exhibition brings together rare black-and-white vintage prints of classic images by Robert Frank, Lee Friedlander, Diane Arbus and Garry Winogrand with works in color by artists ranging from Stephen Shore and William Eggleston to Cindy Sherman, Alec Soth and Andreas Gursky. How the mix of 110 images, produced by some of the pre-eminent artists working in photography from the 1950s has to the present, qualified as a major exhibition at the museum has been a source of controversy. Some Bay Area art critics have suggested that it was improper protocol to give museum space to someone so closely connected with the internal politics of the museum. When Fine Arts Museum director John Buchanan passed in December 2011, Mrs. Wilsey stepped up to run things until a suitable new director could be found and six months later her son has a prominent show in the museum. It might look cozy but, so far, no one has come up with any rules that were violated. The show, which examines different historical understandings of Realism and its changing definitions over time, was curated jointly by Art Historian Kevin Moore, who served as an advisor to Traina on the collection, and Founding Curator of Photography and Chief Administrative Curator at the Fine Arts Museums Julian Cox. Most of us are moved by photography because it provides us with a myriad of possibilities to understand our lives through the power of images. The Traina collection includes some well-known icons as well as powerful works by emerging and experimental young photographers. Notes Cox, “The Traina collection includes many images that sit firmly within the tradition of photography as a craft and a vocation, alongside those made by artists who consider photography as just one medium among others from which they can select to communicate an idea. This use of photography within conceptual art has been at the center of Traina’s most recent activity as a collector, and it brings the exhibition fully into the contemporary moment with new works by artists such as Roe Etheridge, Christopher Williams and Ryan McGinley. Catalogue: An accompanying 136-page catalogue, Real to Real: Photographs from the Traina Collection (2012, $45) features over 85 plates and includes a foreword and introduction by Curator Julian Cox and an essay by art historian Kevin Moore. Details: Real to Real: Photographs from the Traina Collection closes Sunday, September 16, 2012. The de Young Museum is located in Golden Gate Park, 50 Hagiwara Tea Garden Drive, San Francisco. The museum is open Tuesday through Sunday 9:30 a.m. to 5:15 p.m.; Fridays (through November 23, 2012) until 8:45 p.m. and is closed Mondays. For information about museum hours and ticket prices, call (415) 750-3600 or visit www.deyoungmuseum.org .